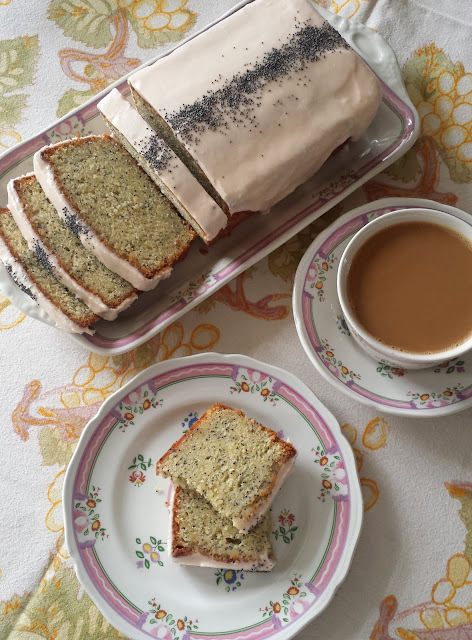 Four years ago today, to celebrate the fact that I had actually managed to maintain a food blog for a whole year, I shared a recipe for a favorite pistachio cake. On the same day one year later, I decided to publish the recipe for another pistachio cake. At that point, it seemed to me that I had established a tradition of sorts: posting something pistachio to mark the passing of each year. That “something pistachio” has more often than not been cake…but not always. Each year it has been a fun exercise to come up with a recipe that features pistachios. Some of these recipes have been involved, and consequently the focus of my attention for some length of time. Others have been the result of a happy and inspired moment in the kitchen. In either case, the question of what I will do for the current year hovers in the back of my mind as the day approaches. 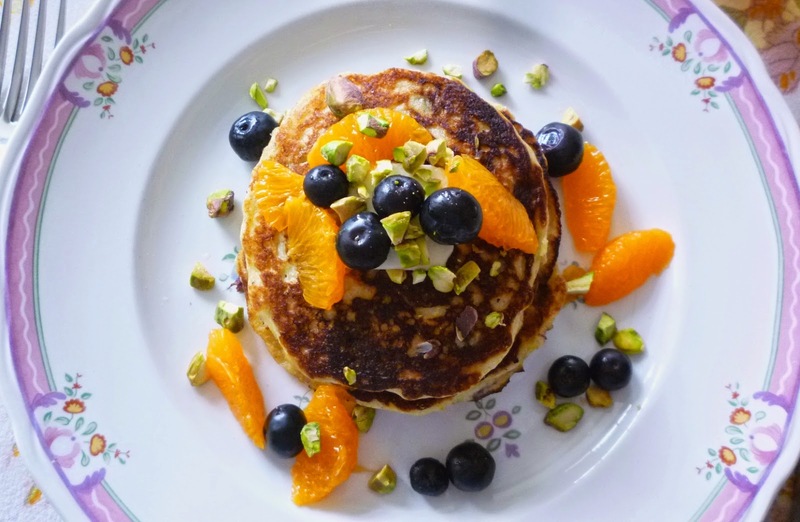 It is no doubt for this reason that a couple of weeks ago, while I was finishing up a plate of particularly fluffy and delicious buttermilk pancakes, it occurred to me that pistachio pancakes would be a nice thing to do this year. Most baked goods respond well to the replacement of 20 to 25 percent of the flour with a finely ground nut (basically a nut flour)…and this is what I did to make my pistachio pancakes. If you don’t have an implement that will grind nuts flour fine (I use a rotary cheese grater fitted with a fine drum—the food processor will create nut butter…not flour), you could just make plain pancakes and sprinkle a few extra finely minced pistachios over the cakes as they cook. 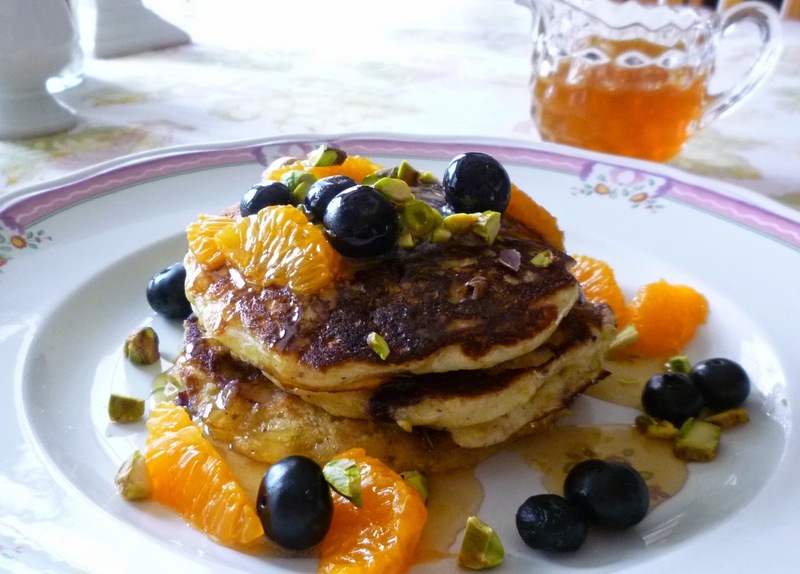 They will not be quite the same, but you will still have pistachio pancakes…and they will still be delicious. 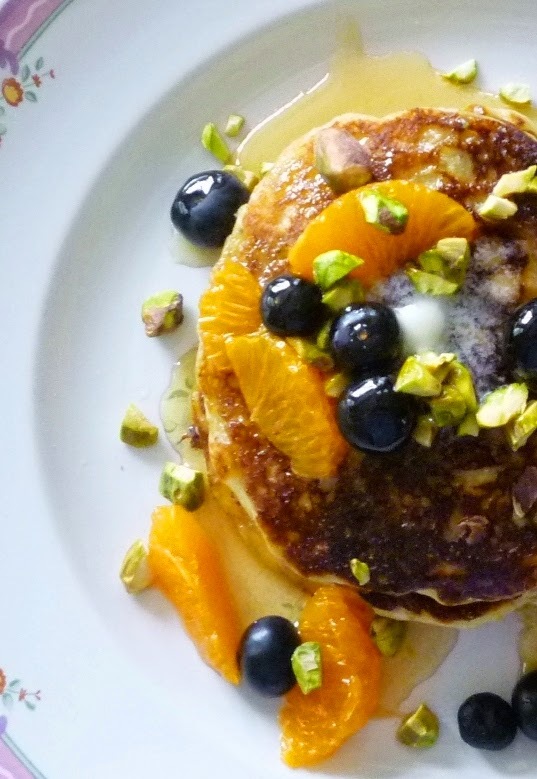 So there you have it: pistachio pancakes to mark year number five. In some ways it is hard to believe it has been that long….and in others, not so much. Blogging has become a normal part of my days…an old friend really. Sometimes it occupies more of my thoughts and my time than others…but for now it has become a fixture in my life. I love the way it forces me to “finish” recipes and to follow through on dishes that I am working on and experimenting with. Mostly though, I love the way that it allows me to share the things I make with even more people. When I hear back from someone who has made something I posted—and in so doing has learned something that makes their time in the kitchen more efficient and enjoyable…and the food on their table more delicious—it truly makes my day. So thank you for visiting…and for trying some of the recipes…and in the process, allowing me to share a part of my table with you. Place the dry ingredients in a bowl and whisk to combine; set aside. Place the egg in a small bowl and whisk in the butter. Whisk in the buttermilk. Make a well in the center of the dry ingredients and pour the wet ingredients into the well. Mix together in as few strokes as possible using a wide rubber spatula. The batter will be lumpy with a few spots of flour showing…this is OK. Melt some butter in a nonstick or cast iron pan over medium to medium-high heat, or in an electric skillet set at 365°. Scoop each pancake using a scant quarter cup ice cream scoop, spreading slightly with the back of the scoop to form 3 inch cakes. 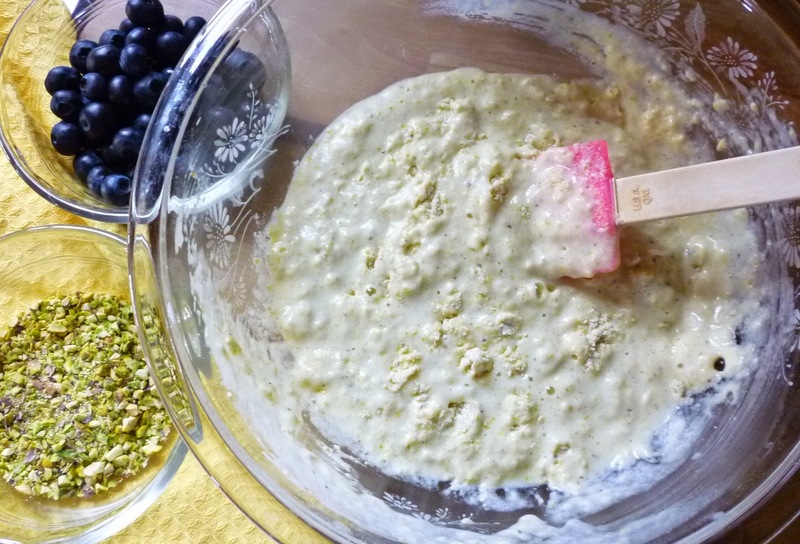 Scatter a few blueberries and some of the finely chopped pistachios over each cake. Continue to cook until bubbles begin to form and pop on the surface or each cake—about 2 minutes. Carefully flip the pancake over and cook until springy to the touch—another 1 1/2 to 2 minutes or so. Keep the pancakes warm in a low oven until all of the cakes have been cooked. Makes 8 to 9 pancakes. Replace pistachios with any favorite nut flour. Pecans would be particularly nice…almonds would be good too. Substitute chocolate chips for the blueberries. Add the zest of an orange to the batter. Note: If serving with the Clementine filets, add the collected juices of the clementines to the maple syrup and simmer until the syrup has thickened slightly. These are beautiful. May I invite myself for breakfast? Bonnie, I would love to have you over for breakfast!